2018 summer, there is a new chapel open on ” Love island” Kouri. Kouri island is located in north of Okinawa main island. It’s famous as magnificent nature, Kouri ocean blue and mythology of the love. Chapel is morif as a sea turtle that believe to bring “happinesses”. You can enjoy dinamic open view from chapel inside. Blight shainny wedding will be unforgettable. Photo shooting at private garden at after the wedding and athome party is available. 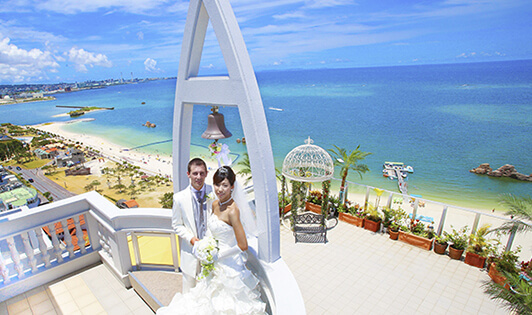 Chapel is at inside of famous sightseen spot “Kouri ocean tower”, you can enjoy sightseen right after wedding. 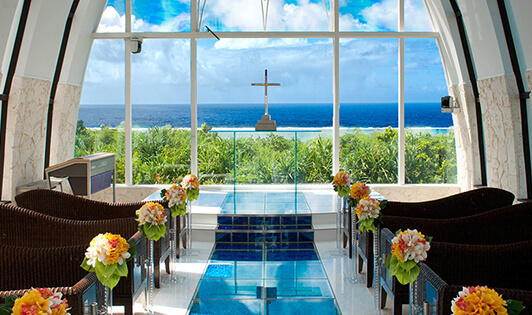 Okinawa Marriott Resort & Spa "THE CLEAR SKY CHAPEL"
In the greedy and superb view of Okinawa’s blue sea, sky, and mountains which cannot feel in daily life, warm ceremonies can be fulfilled in the chapel that feels the warmth of trees. And the wedding where many guests gather for the bride and groom is an irreplaceable place and time. Fresh islands in Okinawa Hospitality at Marriott · Gourmet with plenty of vegetables, meat and fresh fish. Please spend a time to thank each guests and express gratitude. Sakai, The Best French Chef in Japan, opened his first restaurant in Okinawa 2017. It is 「ILE DE RÉ okinawa」. Spend your especially day with your family and best friends at this private garden wedding house. Marin Bijou is builted in 2013. It’s located at next to Kise Beach palace hotel that renovated in 2017. Very blight inside and Big chandelier is welcome to newly wed couple. Civil style arrangement will make your wedding day as unforgettable. You can enjoy the photo shooting at beach there are famous as “Kise beach blue”. An overwhelmingly large resort space with graceful modern sensibility. The ocean view chapel of chalk soaring on the tip of the cape. Spend a supreme moment on a stage where all of the resort wedding completes. A white sanctuary where fuses grandness and British Modern. staircase like a palace.Classic and modern fuses, and invites you to the white sanctuary. The only location in the whole world.Suitable for sophisticated wedding. 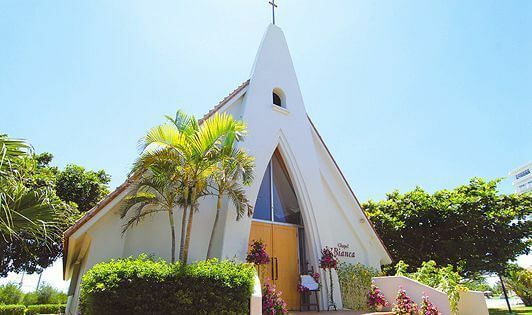 The St. Kabira Church, located on the beautiful beachfront close to the Kabira Bay, a Michelin Green Guide three-starred destination, of the Ishigaki Island, is a real church run by a Christian organization. A wedding service is one of the most important Christian church services. At the St. Kabira Church, every care and consideration is paid for the couple to make their wedding successful and memorable. The Ishigaki Island is renowned worldwide for its crystal blue sea. 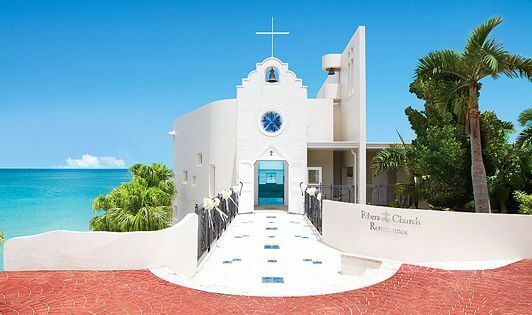 The Crudesur Chapel, the name deriving from the Spanish word “Cruz del Sur” meaning “Southern Cross,” is located on the seafront in the vast 297,500-square-meter site of the ANA InterContinental Ishigaki Resort. It is where couples can realize a resort wedding in the bright sunlight and right beside the emerald green sea. The glass altar and the glass wall behind it give an open ambience to the chapel. The bride walks on the wedding aisle along with the majestic sound of the pipe organ to meet her bridegroom at the altar, where they pledge eternal love with the backdrop of the sea horizon. After the ceremony, the married couple walks down the great staircase at the front of the chapel under a shower of petals. A champagne toast in a gazebo in the hotel garden covered with colorful subtropical flowers will also become an unforgettable event. The Ishigaki Island also offers easy access to Iriomote, Taketomi, Kohama, and other neighboring islands, making your wedding trip truly memorable. 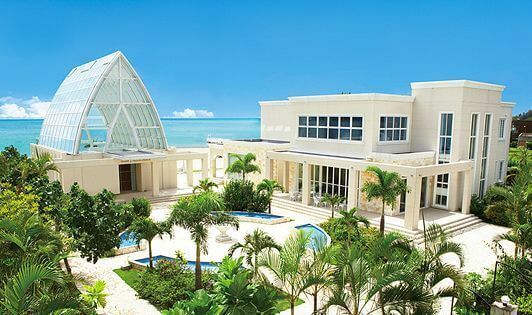 The Allamanda Chapel towering into the sky embodies the “pinnacle of happiness” that the Shigira Bayside Suite Allamanda, a hotel in pursuit of ultimate service, can offer. At the end of the wedding aisle that is reminiscent of white sand in a tropical resort, there is a magnificent view of the crystal blue sea. The sunlight filtering through the dazzling stained glass is colorful and soft. The blue sky and guests celebrate the couple’s eternal love. Not only famous in Asia, Okinawa is also hottest new resort trend in the whole world. 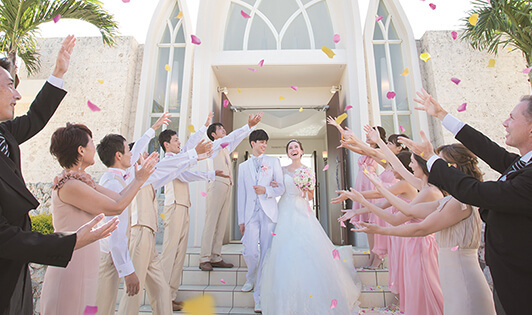 In Okinawa, you can both enjoy wedding ceremony in church, and have fun to take photos in outside together. 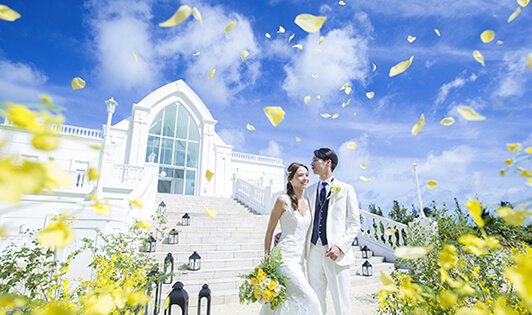 After have a romantic wedding ceremony in the popular church of Southern Beach Hotel & Resort Okinawa -“Sea Shell Blue”, you can have photo shooting between beautiful emerald green sea and azure sky at “BIBI Beach”! In the wedding package of LA-VIE Photography, we service you wedding gown, tuxedo, bridal makeup and intérpreter. Just like a real wonderland, please enjoy the best day of your life! 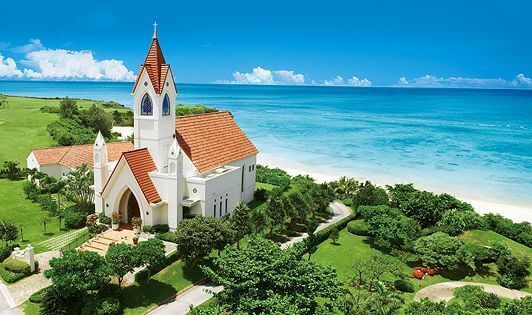 The Cristea Church, located in one of the most luxurious resort areas in Okinawa and surrounded by natural beauty, looks as if it is floating on the sea lying right behind the church. The ocean-view banquet rooms adjacent to the church are an ideal place to welcome guests after the ceremony. The church and banquet rooms offer a perfect setting and first-rate hospitality for the couple and their guests. An approx. 1-hour drive (local road) from the Naha Airport; An approx. The Alivila Glory Chapel, located on the premises of the Hotel Nikko Alivila, an exotic South European style resort hotel, is an elegant chapel with white walls and the red Spanish tile roof standing in a spectacular location overlooking the sea. 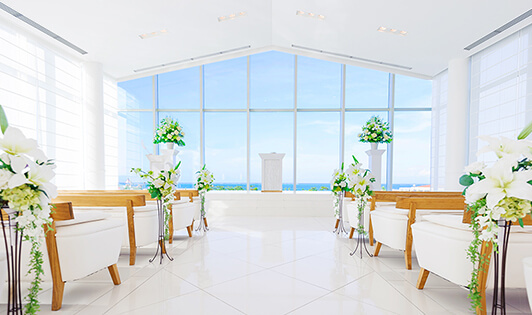 The sunlight that fills the chapel and the blue sea and sky that can be seen through the large glass wall behind the altar add a dramatic effect to the couple’s moment of bliss. After the ceremony on the seafront is time for a reception in a restaurant for intimate dining with guests or on an open-air terrace. The Hotel Nikko Alivila is a hotel where you can forget all about daily chores and spend a leisurely stay in a subtropical flowery and lush green environment. This hotel, which is now the center of attention of many couples, is also known for its picturesque photo spots. 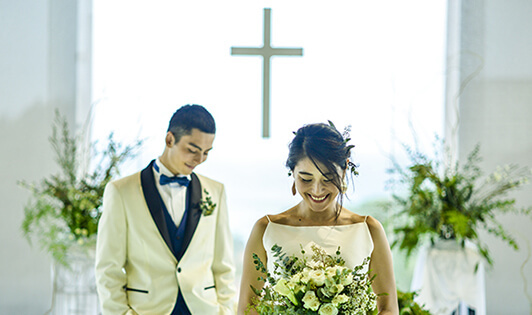 This is the only hotel in Okinawa where you can request all wedding location shoot to be done on its premises. The Aquagrace Chapel is situated beside the Uza Beach in Yomitan Village. Together with ｔhree ocean-view banquet rooms attached to it, the chapel offers an ideal setting for both wedding ceremony and reception. 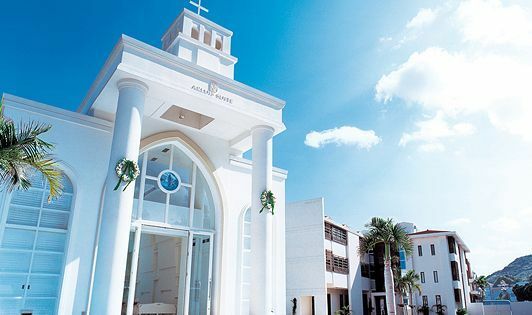 Based on the concept of “aqua” (water) and “grace,” the chapel is designed for refined tastes using Okinawan materials, such as the elegant exterior walls with a natural touch made of Ryukyu limestone as well as stained Ryukyu glass. The chapel also features barrier-free design. 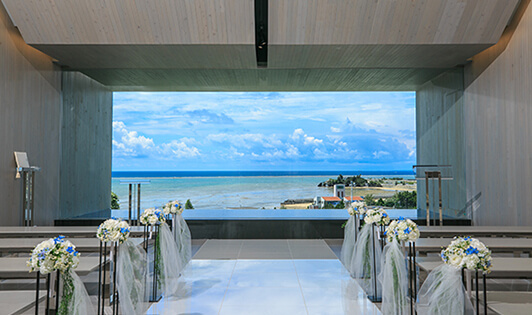 A view of the sea behind the altar, special wedding dishes prepared with Okinawan ingredients for precious guests, memorial photo shoot with the background of the sea to capture the happiest moments of the couple who are like the hero and heroine in a movie. . .Your dream wedding will be realized in this luxurious private space. 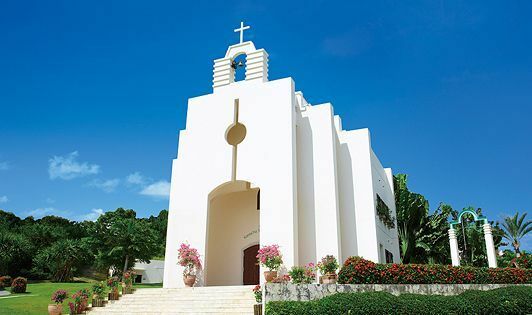 The Chapel Bianca is located on the premises of the Okinawa-Zanpamisaki Royal Hotel surrounded by natural beauty. The charming European-style chapel, standing in a subtropical lush green paradise, looks fantastic with its sloping red tiled triangular roof contrasting with the blue sky in the daytime, and adds to the romantic mood in the evening when illuminated. The interior is white based, and has a pure and sacred air. The bride will be filled with bliss when walking down the marble wedding aisle amid soft sunlight. After the ceremony, the married couple is greeted with the sunny blue sky and a shower of petals—a moment of great joy that they share with their guests. An open-air garden party in the hotel’s vast garden is a perfect choice for lively nature-loving couples. 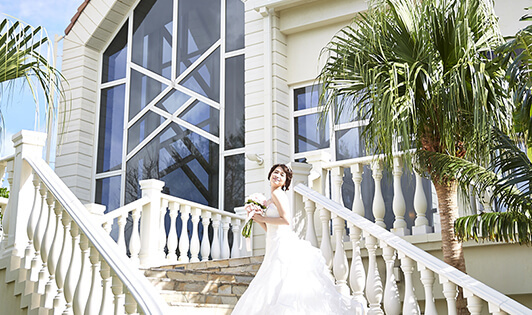 The Arluis Suite is a wedding facility located in Onna Village, one of the most popular resorts in Okinawa. At the center of the facility’s vast site of more than 3,300 m2 stands the Seaside Chapel, which, as its name indicates, is so close to the sea that a wedding ceremony appears as if it became one with the sea. 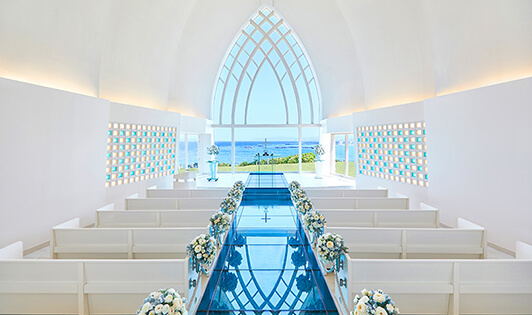 The contrast between the all-white interior of the chapel and the blue sea and sky at the end of the Ryukyu glass wedding aisle is breath-taking and overwhelming. At the White Terrace on the same premises, in an elegant building with waiting rooms and reception halls, which looks like a fashionable boutique hotel, the married couple can have a private party with their closest family and friends right beside the beautiful sea. You can make any arrangements, from an intimate dining party to a large reception, and realize your dream plan that is possible only at this wedding resort. Enjoy luxury wedding in the reserved, private space on the seaside! The standalone Renaissance Ribera Church, designed on the basis of the theme of “sacred seaside,” is reminiscent of a white-wall chapel on the Mediterranean coast. 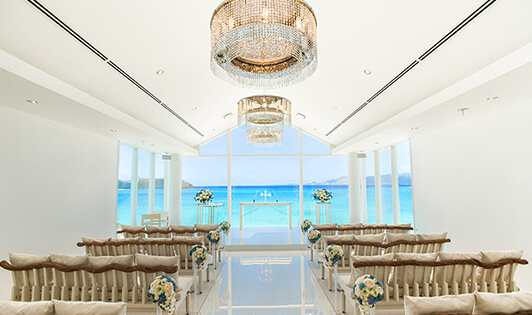 The glass wall with a cross behind the altar offers a magnificent view of the sky and sea, adding a dramatic effect to the ceremony, which appears as if it is taking place on the sea. The wedding in this resort also offers unique joyful programs—a beach parade in a convertible car and a photo opportunity with a dolphin—after the ceremony. A reception in a venue overlooking the sea will also be something special that you can experience only in a resort. The Renaissance Okinawa Resort is also known for its wide variety of marine activities available throughout the year, including the Dolphin Program, diving, and snorkeling. 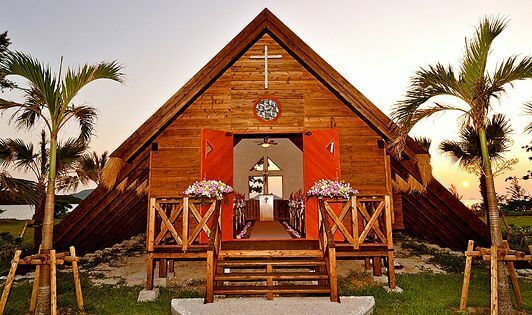 Okinawa’s only two-story chapel located only five meters away from the white sandy beach of the coral reef. The white wall, blue dome roof, and Spanish roof tiles blend well with the surrounding subtropical nature. 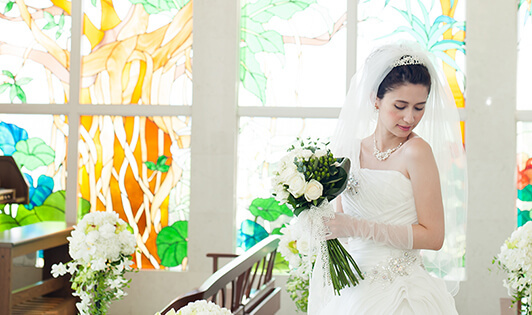 When the elegant door of the chapel is opened, there is a breath-taking view of the crystal-clear sky and emerald green sea at the end of the marble wedding aisle. The altar looks as if it is floating on the sea or in the sky amid soft sunlight filtering through the stained glass, and 12 angels on the dome ceiling celebrate the wedding of the couple above the altar. A reception on the beautiful beachside after the ceremony will be another romantic, memorable experience for the couple. 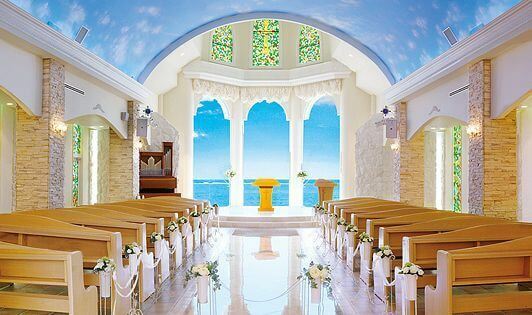 As its name implies, the Aqua Luce Chapel, located on the premises of the ANA InterContinental Manza Beach Resort, one of the most popular hotels in the west coast area of the Okinawa Main Island, is designed on the basis of two themes: “aqua” (water) and “luce” (light). The glass wall behind the altar is 10 meters high, allowing the couple and their guests to feel as if they were integrated with the sunlight, deep blue sky, and emerald green sea. Walking on the wedding aisle along with the grand sound of the pipe organ, while seeing the beautiful landscape of the sea unfold in front of your eyes, will be one of the most moving experiences in your life. A night wedding in the romantic ambience with candles, which add even more warmth to the love of couples, is also available. Thanks to the barrier-free design of the chapel, guests can attend the ceremony comfortably regardless of their physical difficulty or age. Coral is the symbol of happiness, and “vita” (a Latin word meaning “life”) signifies something passed on forever. In front of the chapel lies the sea with a coral reef, which is said to bring eternal happiness. 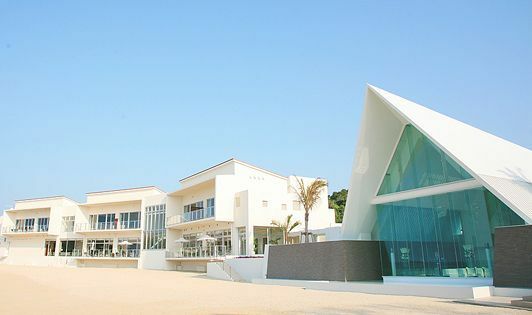 The chapel, built with glass walls on three sides, is filled with bright sunlight, and overlooks the Manzamo cape, one of the most picturesque landscapes in Okinawa, through the glass wall behind the altar. Sacred ceremonies of weddings are performed amid the panoramic views of the sea and sky. After the ceremony, the married couple walks down the great staircase under a shower of petals with the backdrop of the blue sea—one of the features only possible with resort weddings at an authentic chapel on the seafront. The detached banquet hall with a beautiful garden and the restaurants beside the beach are ideal for an intimate reception with your closest friends and family. Vow eternal love on a paradise hill overlooking the diamond-like sparkling ocean and close to the sky. 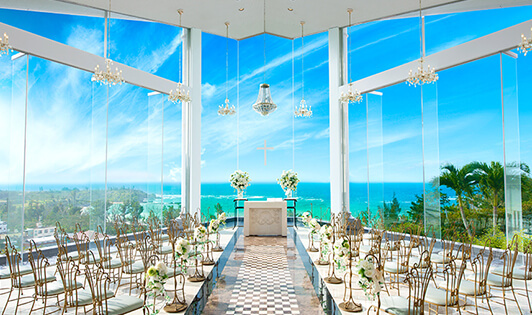 The Chapel Diamond Ocean, located on a hill and built with glass walls all around, offers a 360-degree view of the sea, sky, sun, and forest, making it an ideal place for couples to vow eternal love. Thanks to the high location of the chapel, the vast beautiful sea can be seen throughout the year regardless of tidal action. The wedding in this chapel also features “Affection Veil,” “Water Ceremony,” and various other unique ceremonies performed in the sacred ambiance. The blue sea sparkling in bright sunlight turns to red at sunset, and another beautiful moment with twinkling stars comes in the evening. Make the day the most memorable one for you two on the paradise island. The Kanucha Stellar Chapel is located on the hill of Kanucha Bay Hotel & Villas, a resort hotel lying on an expansive site of more than 2.6 km2. It is a sophisticated South European-style chapel in which a sacred ceremony is performed amid the soft light filtering through stained glass with a star and flower motif behind the altar. When the door of the chapel is opened after the ceremony, the long horizon of the ocean celebrates the couple. The long-stay-type resort Kanucha Bay Hotel & Villas offers a spectrum of leisure and relaxation facilities, allowing couples and their families to enjoy Okinawa to their heart’s content through playing golf, aesthetic treatments, and other features. A chapel beside the sea with abundant nature and sunlight. The adjoining ocean-view party hall offers the resort’s original French-style dishes prepared with plenty of Okinawan ingredients. The special Villa Suites are available exclusively for the bride and bridegroom. Forget all about chores in this superb setting and make memories just for you two at this wedding resort. The Okuma Felicia Church is located on the premises of the OKUMA PRIVATE BEACH & RESORT, a resort hotel blended with its surrounding great nature. 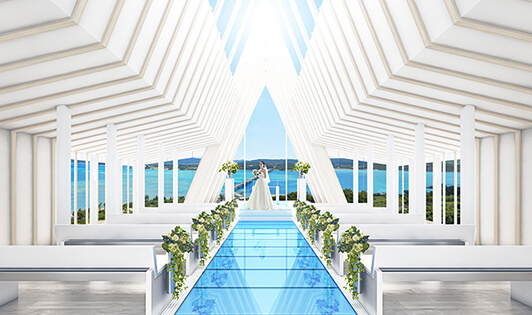 The church, built mainly with glass walls and roof, overlooks a white sandy beach and the crystal blue sea and sky, offering an ideal, gorgeous stage for the couple who swears eternal love. Underneath the glass wedding aisle is white sand, making the aisle look like it is leading to the blue sea. 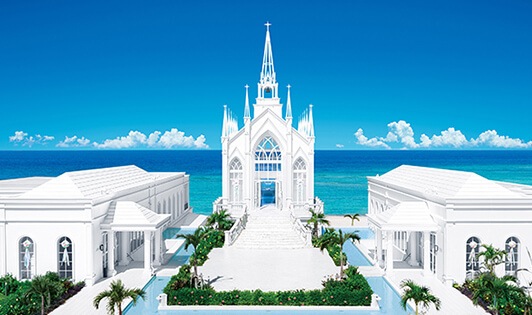 The church in the paradise setting will realize your dream beachfront wedding. A reception can also be held in an ocean-view banquet hall adjacent to the church after the wedding to show gratitude and hospitality to guests.